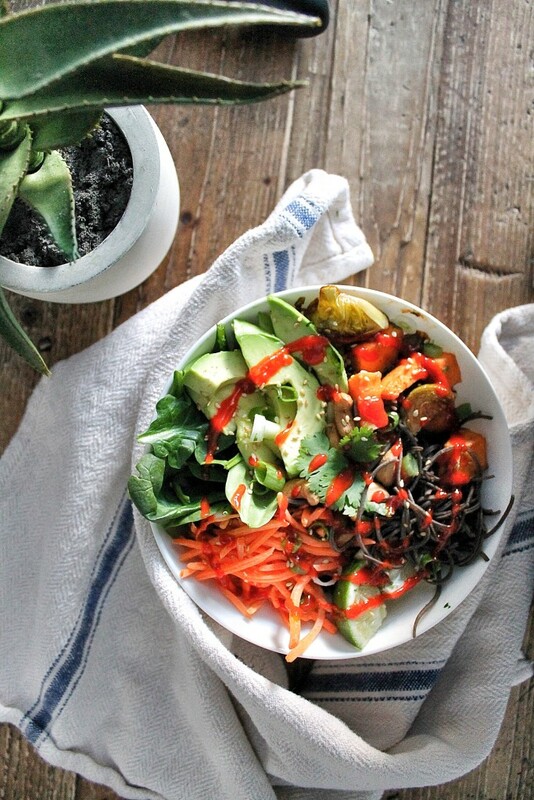 Theres nothing like a mish-mash of different foods in one bowl. Often however, it is difficult for vegans to have a satisfying meal that is both gluten and animal product free. The key here is getting enough protein, that of course does not come from meat. So, is tofu the only option? Not really actually! Beans, seeds, nuts and even vegetables… yes veggies- can be an excellent source of protein. Leafy greens such as spinach for example, give this bowl an added 2 grams of protein. Broccoli also packs a great protein punch- feel free to add it or replace the spinach! The sesame miso gives an amazing deep flavour. 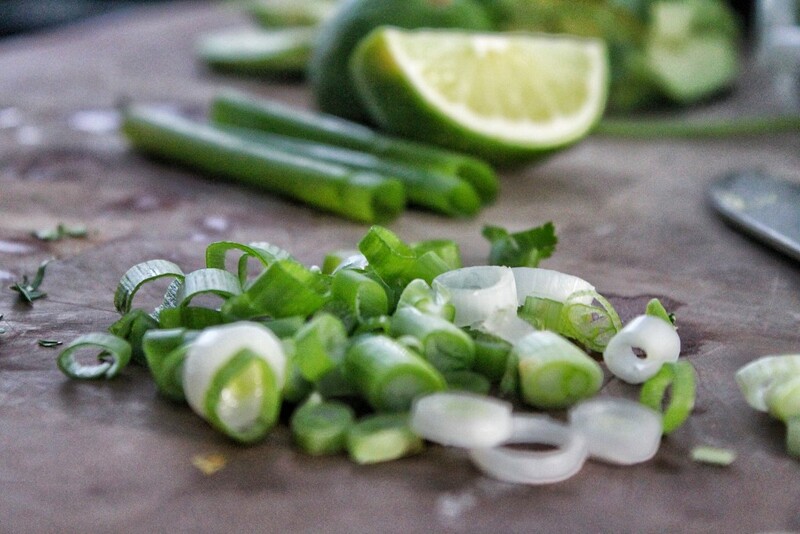 The addition of lime juice and zest give the perfect amount of acid and helps cut the richness. You will get a lot of sweet potatoes and brussels from this recipe, so you’ll be able to make these bowls throughout the week! You’ll just need to make enough of the other ingredients for the amount of people you are serving. so..what nutritional value are you getting? Fermentation allows for good for you gut bacteria to grow. Probiotics are great for a healthy gut. Super high in vitamin A which is essential for growth and development, and for the maintenance of the immune system and good vision. packed with fiber and high amounts of protein. good source of protein, fiber and vitamins! packed with those good for you fats (monounsaturated), which reduces levels of bad cholesterol in your blood and lowers your risk of stroke and heart disease. 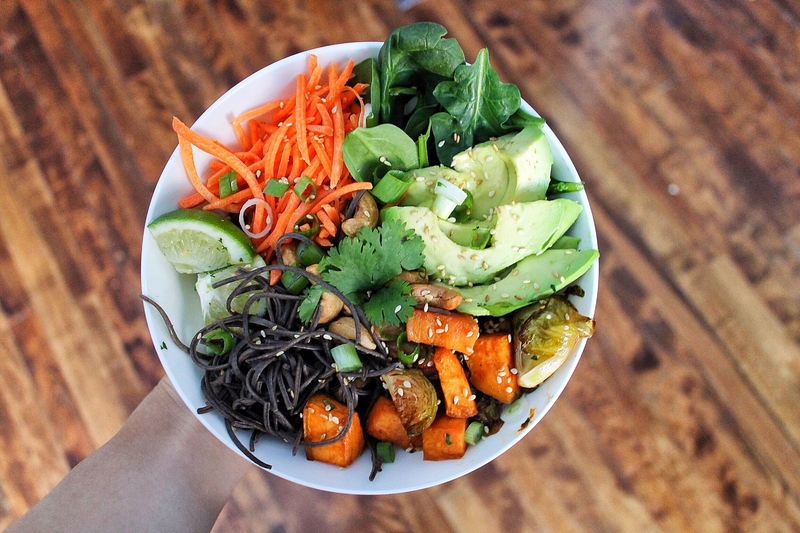 I hope you love this asian inspired vegan power bowl. You will be packed with nutrients and feel fully satisfied without any animal products whatsover. Any meat lover will enjoy this one! Plus- you can serve the sweet potatoes as a side dish for any dish you like! 2. 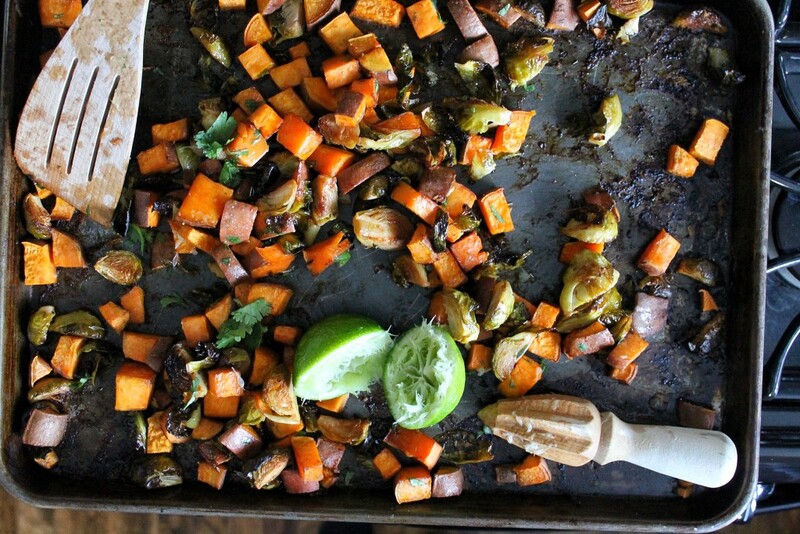 Place chopped sweet potato and brussels sprouts on a baking sheet or roasting pan. 3. 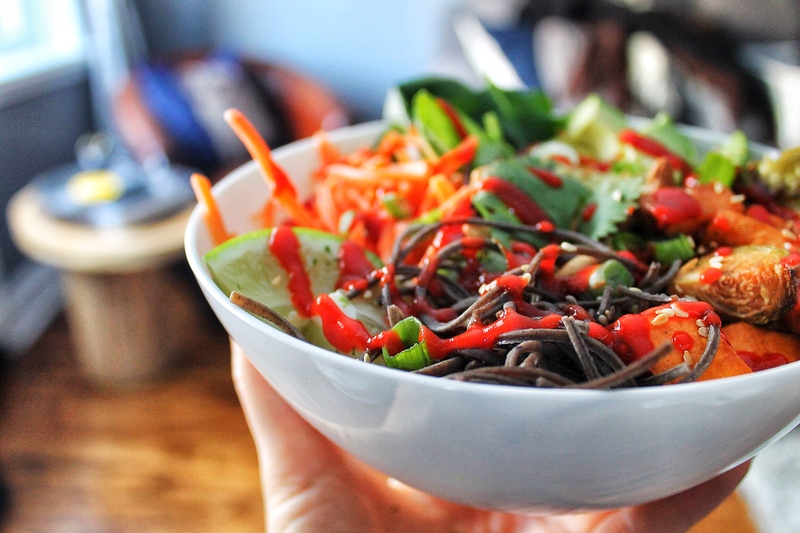 In a small bowl, whisk sesame oil, tamarin, miso, honey, rice wine vinegar, ginger and sriracha. 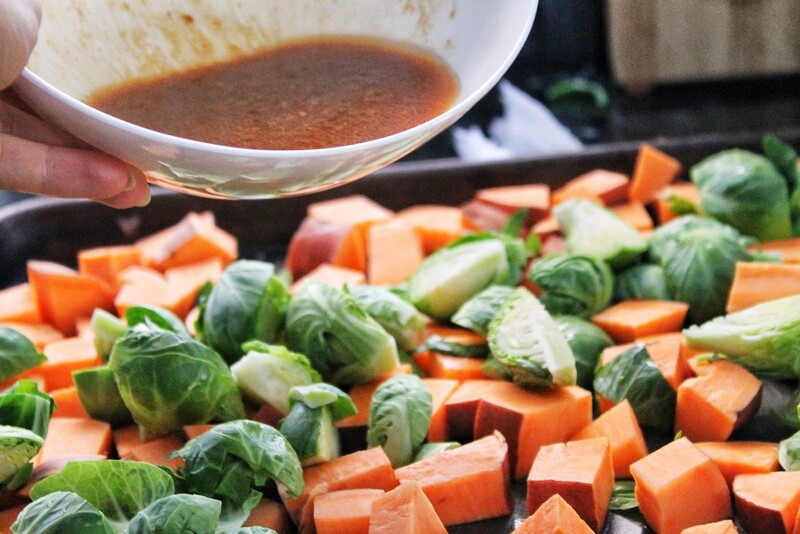 Pour over the brussels and sweet potatoes and mix until well coated. 4. Roast in the oven for 45-60 minutes or until potatoes are cookies through and golden. 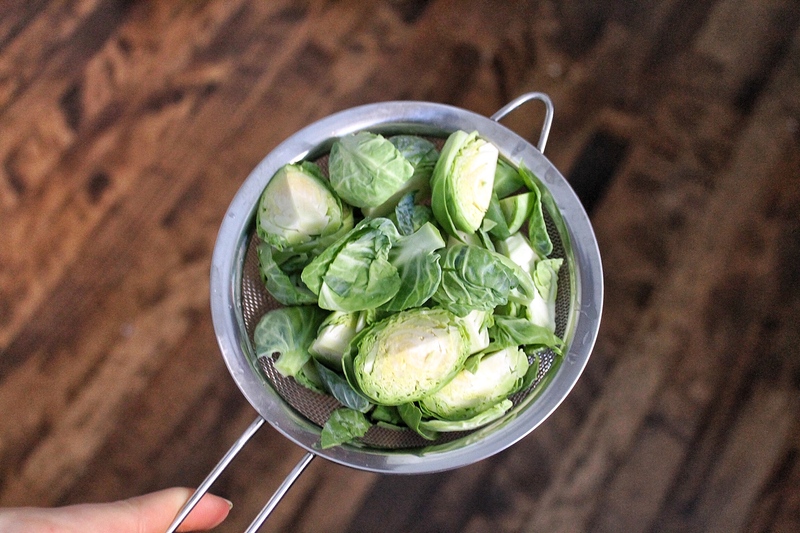 Cook longer for super crispy brussels! 5. While the potatoes are cooking, prepare your bowl ingredients. 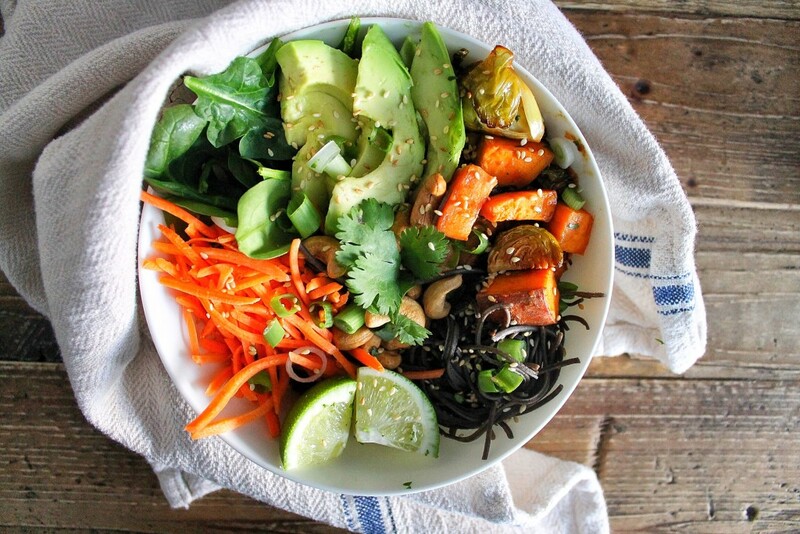 Cook the black bean noodles, chop your green onions, toast your cashews (if not pre roasted), shred your carrots and cut your limes. 5. Remove potatoes from the oven, toss in the juice of one lime + zest and sprinkle with cilantro. Set aside. 6. Arrange your bowl- start by adding about 1/2 cup of noodles at the bottom. Then add your ingredients in piles around the bowl. Sprinkle with green onions, cilantro, sesame seeds and finish with more sriracha and lime juice if you desire! YUM!